Note that there was an amendment to the Agenda for the Twenty-First Annual General Meeting (AGM) of the Members of Copperbelt Energy Corporation Plc to be held at the CEC Ravens Country Club, Kitwe on Friday, 29th March 2019 commencing at 10:00 hours. 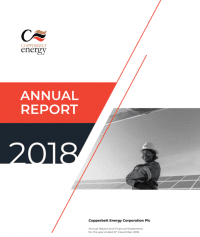 As such, we provide the amended 2018 annual report with the corrected Notice of the AGM which appears from page 148 of the annual report. The related Forms of Proxy are on pages 171 and 173 of the report. Call to order, tabling of proxies and announcement concerning quorum in attendance. To consider and adopt the minutes of the Twentieth Annual General Meeting held on Thursday, 29th March 2018. To receive and adopt the Directors’ Report and the Financial Statements for the year ended 31st December 2018 together with the Report thereon of the Auditors. To ratify the dividend payment made on 5th March 2018. To consider and adopt the recommendation for the appointment of Messrs PricewaterhouseCoopers as Auditors of the Company at an agreed fee of ZMW1,080,000 net of VAT and disbursements. To ratify the appointment to the Board of Mr. London Mwafulilwa and Dr. Patrick Nkanza, as Directors of the Company, effected by Board resolution on 28th August 2018, following the retirement of Mr Hanson Sindowe, Mr. Michael Tarney and Dr. Sixtus Mulenga and the concurrent restructuring of the Board, on 10th August 2018. Mr. London Mwafulilwa and Dr. Patrick Nkanza will retire as Directors at the Annual General Meeting and in accordance with Article 14.4 of the Articles of Association are eligible for re-election. To consider and adopt the recommendation of the Board for the appointment of Mr. London Mwafulilwa and Dr. Patrick Nkanza as Directors of the Company in accordance with Article 14.4 of the Articles of Association. The Directors recommend the appointment of Mr. Mwafulilwa and Dr. Nkanza as Directors, in accordance with Article 14.4 of the Articles of Association, to hold office until the conclusion of the next Annual General Meeting of the Company at which they will retire. To consider and approve a 1.9% adjustment to the remuneration of the Directors. To transact such other business as may properly be transacted at an Annual General Meeting.